Evidence shows that deconditioning because of pain and reduced activity in people who have chronic back pain can result in weakened muscles of the low back and spine. It is possible for the body to be strong everywhere except the back. The back can only be strengthened when the lumbar spine is moving against resistance. and typically, if you have back pain, you will (unknowingly) change your body mechanics to protect your back, substituting pelvic motion for lumbar motion. 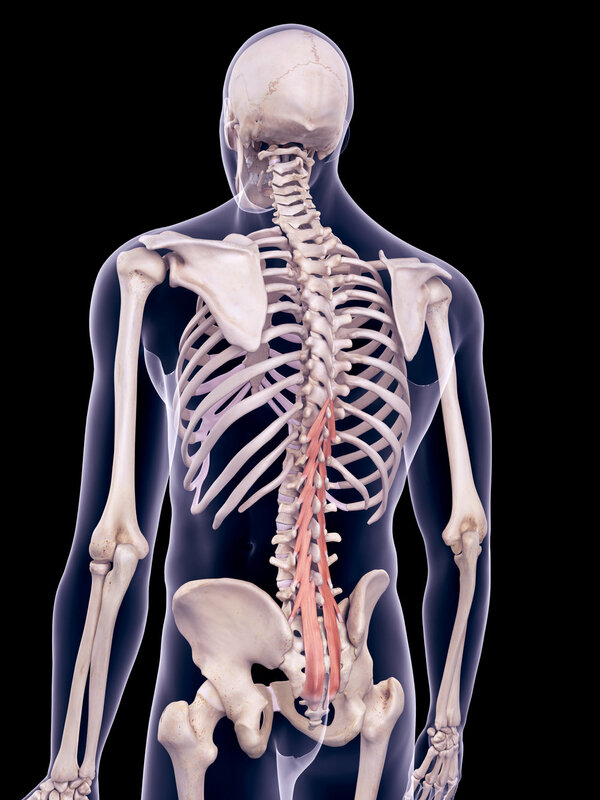 When we talk about the muscles of the back, we are referring to the lumbar extensor muscles at the back (right) which are attached to the spine and stabilise, rotate and extend the back. When we talk about the core muscles, however, we are referring to the muscles of the trunk (Rectus Abdominis, Obliques and Transverse Abdominis - left - as well as the lumbar extensors) which surround the mid-section, front and back like a corset, stabilising the trunk as the limbs move, providing support for the back and helping us bend and rotate. It is the primary job of your core and back muscles to keep you upright. When the muscles aren’t strong enough to support your body, they fatigue and ache as demand on them increases. Same as above, your back and core will be working extra hard to maintain your posture and technique as you run/exercise or will force other muscles to work harder to compensate. This could be a sign of muscle weakness. Again, your core and back have been working hard to maintain your position all day and may tire as the day progresses. Your core muscles are designed to carry your body in the best position for your comfort and health and to maintain correct alignment of your body, that is how your head, shoulders, spine, hips, knees and ankles line up with each other. You should have a natural ‘s’ shape in your spine, so if you are not in alignment (for example, if your shoulders are rounded and your spine curves forwards excessively), your muscles become imbalanced. Some become shorter and tighter and others long and weak resulting in a reduction of use and weakening as a result. When we stand and move, our deep core muscles are activated and working to keep us upright and to facilitate movement. As soon as we sit, the muscles switch off. This prolonged decrease in use can cause them to weaken over time. During pregnancy, the muscles at the front of the abdomen stretch and separate to accommodate the growing baby. This, combined with the tipping forward of the pelvis affects the ability to stabilise the core and weakens the muscles as they elongate. The pelvic floor muscles also make up part of the ‘core’. They are essentially a hammock at the bottom of the pelvis, supporting the pelvic organs. As the baby passes through the pelvic floor muscles during birth, core stability is further compromised, and the pelvic floor can become weak. During a caesarean delivery, the abdominal muscles are separated to allow the baby to be delivered. After they are stitched back together, scar tissue forms, which can affect the muscle’s ability to work properly as they contract. If the abdominal muscles have been cut during any abdominal surgery, just as with a C-section (above), the formation of scar tissue where the incision was made will affect the muscles’ ability to contract and may result in decreased strength. There may be an imbalance of the core muscles if they are forced to maintain an unnatural position for prolonged periods. This can be common in occupations such as mechanics, bricklayers and carpet fitters to give a few examples. To speak to a back pain specialist about strengthening your core and back to reduce back pain, claim your complimentary ‘reduce back pain’ consultation. To claim, enter your details below and we’ll be in touch to arrange your session. Thank you for registering for a consultation. We’ll be in touch within 24 hours to book your session. Older PostWhat is Facet Joint Syndrome?